Nice nice. Like the honesty here, makes sense. I would agree that we'll need to win the turnover battle. Also remember their secondary isn't as good as last year. They have a rookie safety and no Dashon Golson, so that could be a weak spot for them. I see lots of quick slats in this game, trying to get the ball out of A-Rod's hands ASAP. I think the game will be closer than people think. Love the optimism. True storytellers perspective. 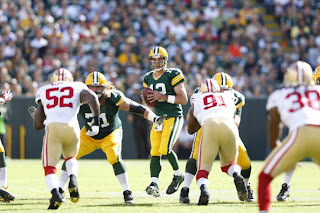 Unfortunately, the 49ers present the toughest possible matchup for the Packers. Week 1 in San Fran I don't see it. Niners 27-20. Should be an adversity laden season with the Pack hopefully peaking at the end like the 2010 Super Bowl run. Pack 10-6 and if Lacy emerges along with a combo of Nick Perry and/or someone else on the d-line we can make a late season run at the thing. My first post was much more eloquent than this but my iphone had a brain fart.